As I have been wondering for months since Trump's daughter Ivanka made climate change her focus in her father's White House; when will Trump finally cave on this long prophesied agenda of the Pope regarding climate change? Well, this meeting is not only the focus of a new video I'm working on, (from last Friday's blog entry) it's also what all students of prophecy have been watching for all along because we know prophecy will be fulfilled no matter how much Trump is against it. 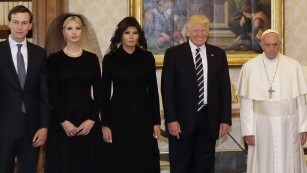 And as expected, Trump had his meeting with the Pope, and as was also expected they had their meeting behind closed doors so as to keep the people they promised transparency with are kept in the dark, because as also prophesied their deeds are from the darkened realm of Satan. And if their constituents knew they would boldly revolt. As I have been saying for months in church discussion, emails, phone calls and some face to face meetings with like-minded brethren; Trump will definitely have to cave on his staunch stand against the Pope's global warming aka, climate change. Again, prophecy must be fulfilled even though Trump, being a member of a Vatican influenced church, is taught by pastors in his church that have no clue this was predicted in Scripture and so he must change his mind on climate change. But, if he refuses he can forget about a second term or worse yet, end up like JFK. The Pope is that adamant about pushing climate change so as to have the power in all nations to enforce the mark of the beast and no man; no matter how popular he is, (like JFK was) will stand in his way. Still, Trump is a man driven by pride and so it's not likely he will openly or easily admit he is wrong without doing so in a way that help him save face. He will still have to cave on this no matter what. But he may choose to milk this to bolster his pride to stand before all claiming how "humble" he is to admit on camera that he was wrong. In any event, he has to somehow flip on his publicly proclaimed stance on climate change. And when he does, it will be in a way he can still stand his ground while at the same time doing whatever the Pope needs him to do. For example, do you recall what Trump said in his campaign about removing the 501c3 and how he kept dropping hints about how the Christians in America are the largest lobbying group in the nation? Many pundits in and outside the churches used his talking points to declare he was going to completely remove the 501c3 and as you recall in a video I did back then, I stated as I am sure many students of prophecy also stated, Trump will never remove the 501c3 because it is the prophesied image of the beast and it is a necessary cog in the wheel that gets the mark enforced. And so as expected, and as I outlined in another video I did 2 weeks ago, Trump didn't remove the 501c3 at all. But instead and as I repeatedly stated, he did rewrite how it was structured by Lyndon Johnson back in 1954 so as to allow the government approved pastors to keep their tax free status while lobbying for religious laws on their pulpits. Well, this climate change stance of his is no different. And especially since his own daughter has already publicly taken the position to promote climate change in his own White House, and so there's his out. Me thinks he allowed her to take that stand just in case the Pope "forced" his hand. So now, he can actually pull a Pilot and wash his hands of the whole deal and allow his White House to push it for the Pope anyway. As we all know, Trump is that strange when it comes to how he moves politically. In short, he will allow the White House to remain in the Paris agreement. That all being said, whether he openly admits defeat to bolster his pride, or plays the part of a man that stands his ground but then drops it in the hands of someone else claiming he doesn't have time to deal with it, doesn't matter. Because the bottom line is; he must go along with the Pope on this. Christian prophecy will be fulfilled. But me thinks all of this is nothing more than a smokescreen allowing for closed door shenanigans to go forth in the coming weeks and months. I mean, the fact his daughter is already promoting the Pope's agenda in the White House confirms; Trump already caved!